On Wednesday, June 13, 2012, playwright DeeDee Stewart and WriterHouse member Elizabeth Derby discussed Stewart’s journey from blog posts about her southern childhood to the international premiere of her one-woman show “Dirty Barbie and Other Girlhood Tales” at the Edinburgh Fringe Festival. She talked about the process of turning scenes from her life into a sold-out show. On a recent Wednesday evening, the cast and crew of Live Arts’ production of The Drowsy Chaperone prepared for the relaunch of their musical comedy. The show debuted in mid-December to glowing reviews, but took a a break for the holidays. I stopped by the brush-up rehearsal to find out more. In this podcast, we hear from actors Doug Schneider, Kimberly Hoffacker, Jane Scatena as well as director Ray Nedzel and musical director John Carden. Drowsy Chaperone reopens this Saturday and runs through January 16 in Live Arts Downstage Theater. Ticket information is available on Live Arts’ website. If you’re going, make sure to download the helpful study guide. The Wooden Birds were Anne Williams’ guest at The Sound Studios on Saturday afternoon before their show at The Southern. They played several tunes from their album “Magnolia” and chatted with Anne about their tour and the development of their band. Videos from this in-studio are up at youtube.com/wnrnradio. To learn more about The Sound Studios, check out thesoundstudios.net. This morning on Acoustic Sunrise, Danny Schmidt was Anne Williams’ guest. He is celebrating the release of his new album, “Instead the Forest Rose to Sing” with two shows tonight. The shows have been moved from Gravity Lounge to Live Arts. Youtube.com/WNRNradio will have videos from this interview. Live Arts is bringing a Thornton Wilder classic to their Downstage. 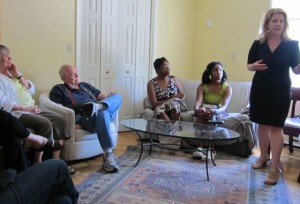 I had the oppurtunity this past weekend to talk with the director, Mendy St. Ours; the acting couch/assistant director, Carol Pederson; the set designer, Mary Butcher; and 5 of the actors (of a cast of 18), Chris Patrick, Casey Wagner, Ronda Hewitt, Denise Stewart and Chris Baumer. Will Slusher, the assistant set designer, who Mary Butcher says was “an incredible asset to the show – indispensable to the design and construction of the set,” was busy with the table saw during this interview. This Thornton Wilder farce opens at Live Arts Friday March 6, 2009. Live Arts opens its Upstage with Pearl Cleage’s Flyin’ West. I had a chance to talk with Ray Smith, the director of the show, and most of the cast which includes, Carrie Stuart, David Straughn, Jared Ivory, Sharon Millner, Stori Ayers and Ty Daniels. 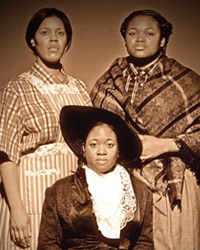 Flyin’ West tells the story 4 African American Women Pioneers just after slavery was abolished and they flew west for a live and home of their own. Live Arts is on the cutting edge again… just ask any ‘tween. In the great tradition of American Musical Comedy Love Stories, Live Arts is presenting Disney’s High School Musical this summer from July 11 to August 2, on the main stage, with all local talent. As the actors warmed up for their final rehearsal, I had a chance to sit in the back of the theatre and talk to the director, designer and then briefly meet the cast. Mother Courage and Her Children opens March 28th at Live Arts, downstage, the big stage, with Fran Smith [a Live Arts founder] playing the title character. Mother Courage was written in 1939 by the German dramatist and poet Bertolt Brecht — one of the heroes of modern theatre. This play is often considered the greatest anti-war play of all times. And now, Live Arts presents a new translation/adaptation by one of the greatest living English playwrights, David Hare. If you can you image a time where war dominates the headlines, where economies hinge on that very war, and where the men in power say the war is necessary, yet won’t fight themselves – if you can image that – you might just find yourself among friends at Live Arts over the next month. Satch Huizenga directs Mother Courage at Live Arts and we stole a few minutes of his time to ask how this 59 year old play remains timeless. In the Blood, by Suzan-Lori Parks, is a play about Hester, a homeless mother of five. Hester is a daughter of our society, the mother or our children, and a victim of her own well meant intentions. She is us; and she is the person we walk by, judge and ignore. Listen here to a conversation with the show’s director, Clinton Johston; and lead actor, Aisha RenÃ©e Moore.